A year ago, I wrote about our favorite travel stroller, the UPPAbaby G-LUXE stroller we bought when B was just over a year old. Three years later, our G-Luxe is still going strong! It is durable and reliable - Our G-LUXE has been gate-checked on three dozen flights, bounced over miles and miles of cobblestones at the Acropolis, Ephesus and Pompeii, bumped along the wild trails of Komodo, been folded up and unfolded hundreds of times and it works as well today as the first day we had it. Over the last three years, it has taken a real beating and it still keeps going! Easy to clean - The fabric is easy to wipe clean and the latest model has a removable cover that can go in the washing machine. Comfortable - It reclines almost all of the way back so it is easy for B to sleep in if we are waiting to board a late-night flight or wandering around during nap time. The foot rest is adjustable and the sun canopy effectively keeps the sun out of B's eyes. Lots of storage space - The large mesh basket below the seat is big enough to store pretty much everything we need along the way. Functional - It is fast and easy to open and shut. And it STANDS easily when folded! 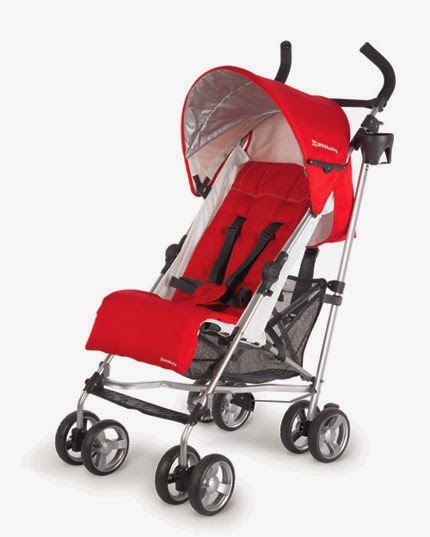 Lightweight - According to the manufacturer, it is the lightest reclining full-size umbrella stroller available in the U.S. At only 11 lbs, it is easy to tote about when not in use with the convenient shoulder strap. Compact - When folded, it is very compact and easily fits through airport x-ray scanners and in the smallest cruise cabin closet. It retails on the manufacturer's website for $189.99 and I have found it is worth every penny. What is your favorite travel stroller?